Why Use Chicken Feed Mill? Improving the feed conversion: plenty of finished experiments and field testing proves that feed pellet made by chicken feed mill can improve the feed transformation ratio, comparing with traditional feed. Increasing feeding effect: the feed pellet is formed with solid, thus the chicken feeder has no need to worry about the chicken being picky, because the nutritional materials in the feed pellet are not separate. Healthy: high temperature and pressure during the feed pelleting kills the majority of parasites existing in chicken feed, which naturally reducing the chicken parasitic load. Reducing dust: chicken feed pellet made by chicken feed mill is almost no dust, instead of powder feed rich with rich powder. The dusty feed has no good palatability, causing the risks of respiratory disease. Covering a little storage area: chicken feed pellet is packed into bags which covers less space for every unit weight, easier to store. Ring die chicken feed mill is mainly composed of feeder (screw feeding machine), quenching and tempering device (regulator), panel, pressure transfer system, over-load protection and electric controlling system. This ring die chicken feed machine adopts forced feed, the raw material is forced into the pelleting room and distributed by the high-speed rotary scraper. 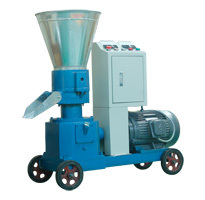 Ring die chicken feed machine has a high output of 0.8-2t/h with one single set machine. Flat die chicken feed mill, specially designed for professional small feed production. This chicken feed mill is featured with scientific and reasonable structure and design, easy operation, high output, low consumption, high forming ratio, suitable for processing corn, bean pulp, straw, grass, peanut shell etc. According to the power forces, the chicken feed mill is divided into electric motor type, diesel type, PTO type. Ring Die or Flat Die Chicken Feed Mill? 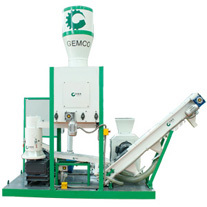 R: Ring die pellet mill adopts feeding basin which rotates in a fast speed to place the materials in to the pelletizing room, that is to say, the roller press rotates there just as soon as the material enters into pelletizing room. F: Flat die pellet mill places the materials into the pelletizing room by the self-weight of material. R: The range for adjusting compression ratio of ring die pellet mill is large. F: The range for adjusting compression ratio of ring die pellet mill is small. R: With modulator and inletting to steam tempering. F: No modulator, no inlet to steam tempering. Ring die pellet mill is suitable for feed factory to produce high-grade feed. Flat die pellet mill is suitable for small scale users, household farmer and producing coarse fiber pellets.